The world has changed: Since the financial crisis, there has been an increased awareness about the globally interconnected world of business; its complexity and sustainability. Some would believe that its unpredictable and situations change rapidly which is resulting in the obsolescence of existing models to deal with complexity and uncertainty. 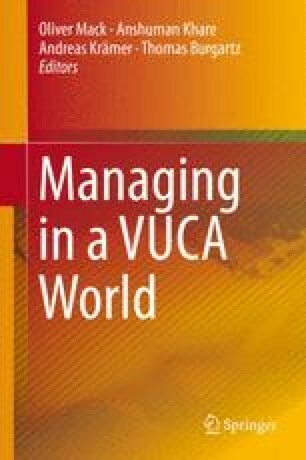 Some call the situation today a “VUCA” environment (Volatility, Uncertainty, Complexity, Ambiguity) (http://knowledgenetwork.thunderbird.edu/research/2012/07/09/kinsinger-walch-vuca/). The mainstream of applied management tools and frameworks is still unchanged: While the business environment is rapidly undergoing a change, the business tools and frameworks are lagging behind. Need for broader knowledge and application new concepts and frameworks: This book attempts to bring together and discuss concepts, tools and frameworks for management to cope with the new situation. The book will be of use to academics, practitioners and those who are just starting to engage with the business world.